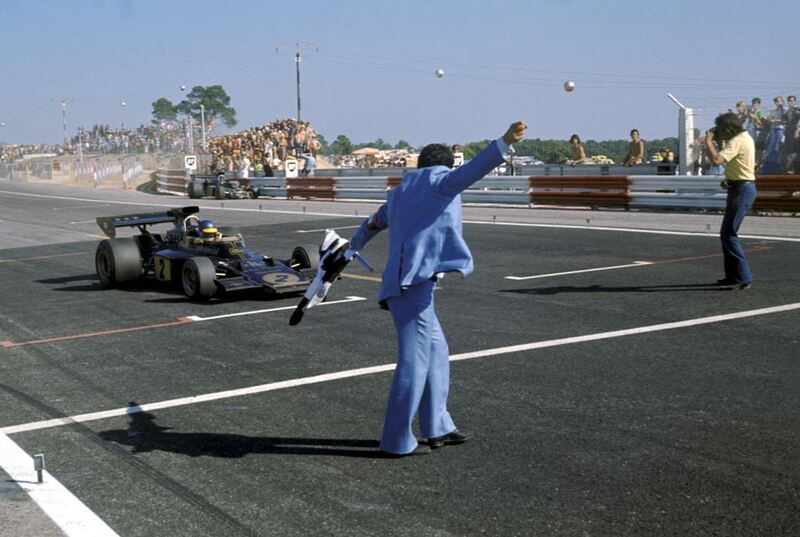 Ronnie Peterson had been denied victory in front of his home fans in the previous race thanks to a stroke of misfortune but it was the Swede's turn to enjoy a slice of luck at the French Grand Prix. Jackie Stewart took pole position for Tyrrell from Jody Scheckter's McLaren and the Lotus of Emerson Fittipaldi. Peterson found himself back in fifth behind the second Tyrrell of Francois Cevert. It was Scheckter who made the best start, leading Peterson and Stewart. Denny Hulme started well to jump to fourth ahead of Emerson Fittipaldi but he then dropped back after pitting with a puncture. Hulme rejoined but eventually finished down in eighth. He wasn't alone in suffering tyre problems as Stewart also pitted for fresh rubber. Behind race-leader Scheckter, Peterson waved team-mate Fittipaldi through to set about the South African. So the gap dropped and Fittipaldi was on the tail of the McLaren when they came up to lap the BRM of Jean-Pierre Beltoise. Fittipaldi sensed a moment of indecision from Scheckter he went for the gap but the two cars collided, eliminating both from the race. So Peterson inherited the lead and took his first grand prix win ahead of local favourite Cevert and Carlos Reutemann with Stewart fourth after his pit stop. The result meant that Stewart led the championship from Fittipaldi and Cevert.